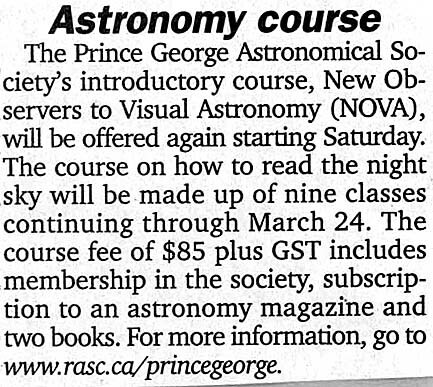 Overview: Fall 2006 session of NOVA (New Observers to Visual Astronomy) starts. This entry was posted in 2006, Newspaper Articles on October 18, 2006 by glen_h. Minutes of September 13, 2006 meeting were circulated. Motion: Accept the minutes as distributed. Motion: To accept the Treasurer’s report as presented. Telescope drive upgrade – December time frame for the installation of worm and gear. Bob will email out a list of tools required to do the job. Manpower requirements will be worked out prior to holding the work bee. 4 Shooter upgrade tabled indefinitely. The snowplowing issue has not been fully resolved yet, although Wayne has applied for a ‘Snow Board’ from YRB. When the snowboard is displayed, YRB will plow the driveway at their convenience, and at a cost. Jim is going to look for a small yard tractor with snowblower attachment. After Maurice is reimbursed for the insurance costs, the remaining gaming funds will be allocated to prepaying the utilities. Bob presented an impressive business case for purchasing an ST9 CCD camera and filter wheel. Support for his case came from Dr E.F. Milone, Faculty Professor at the University of Calgary, and Orla Aaquist, President of the RASC Edmonton Centre. Their letters of support are attached to the printed and filed executive minutes. The carpenter ant problem has been resolved. The tools have been purchased. Once the 24″ scope is upgraded and demand for it’s use increases, the tour and events director will handle scheduling. First priority will be given to open houses, member’s nights, and scheduled tours. The privacy statement provided by Blair will be posted to the website. To ensure privacy is maintained, all email broadcast messages to the general membership are to be Bcc’d. Approval was given to purchase a water tank level monitor. Approximate cost is $160. Motion: Purchase a copy of Quicken to be installed on the treasurer’s laptop. Approximate cost is $100. Thanks to efforts by Blair, BC Bearings donated $1887 worth of bearings to replace those associated with the dome rotation. Glen will send out a thank you letter. Bylaw wording to change the term of officers to 2 years is being worked out and will be voted on at the AGM. Also to be voted on at the AGM is that quorum requirements be changed to 4 executive members, 3 of which will be a combination of President, Vice President, Secretary, and Treasurer. Blair and Wayne will be offering the public an opportunity to observe the transit of Mercury. The observatory will be open during the day on November 8th. As no funds were allocated for this event, free advertising will be sought through CBC, and Paul Strickland at the Citizen. This entry was posted in 2005 / 2006, Meeting Minutes on October 11, 2006 by glen_h.